Known for its strong aroma, garlic is prized in the kitchen, especially in Italian dishes. Garlic is also a simple herb to grow. Experiment with garlic bulbs from your local grocery store or purchase one of the many varieties from a seed supplier or nursery. Garlic requires at least 8 months to reach maturity, so planting takes place in the fall for spring or early summer harvest. Garlic is a suitable edible plant for apartment gardeners since it grows just as well in a pot as it does in the ground. Fill a 12-inch container with nutrient rich potting soil or work compost into your outdoor planting bed for garden growing. Prepare to plant after the first frost of autumn. Peel off the paper-like skin on the outside of the garlic bulb. Pull apart the individual garlic cloves from the bulb to separate. Choose the largest cloves for planting. Larger cloves grow into larger bulbs. Save the small cloves for cooking. Dig a hole 2 inches deeper than the length of the clove. Set the clove in the hole pointed end up and cover with soil. Leave 6 inches between each clove when planting. Cover the soil with an organic mulch, such as straw. Mulch both garden beds and containers to protect against extreme cold, weeds and pests. Place containers outside after mulching. Keep the soil moist. Water only as needed to keep the bed or container from completely drying out. Harvest in the late spring after the leaves have begun to die back but there is still some green remaining on the plant--from mid-May into August depending on the variety. Dig the dirt away from around the garlic carefully to avoid damaging the bulb, then lift it from the soil. Cut the flowers off the garlic stalk as they form to encourage larger bulb growth. Replace the soil in containers or rotate your garlic bed to help prevent pests and disease. 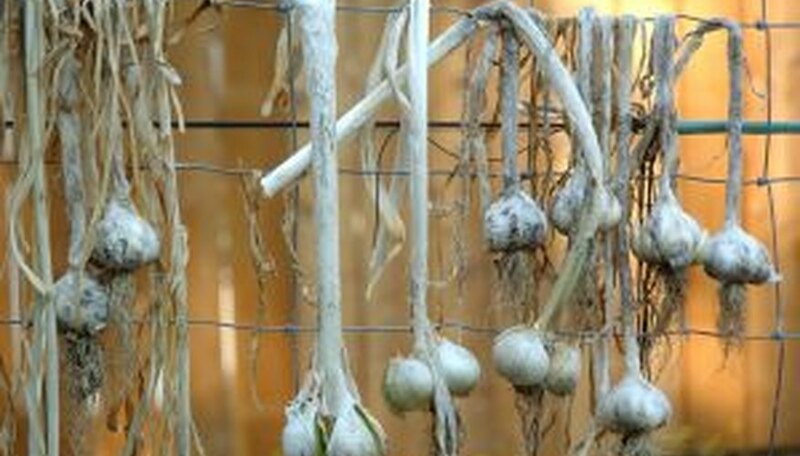 Move garlic into a shaded area soon after harvesting to avoid sun damage to bulbs. Over watering will inhibit bulb growth or cause the bulb to rot in the ground.